Total length only approx 3m (MV-10: 4.5m), transport length only 1m (MV-10: 1.35m), setup in 5 minutes, very sutiable for portable operation, fits in any car trunk. The resonance frequencies are adjusted for each band separately (except 10 and 12m, which influence each other slightly and might require a tuner). The antenna is made from extruded aluminium tubes, all mounting hardware except mast clamp is stainless steel. The antenna works on all bands as a quarter wave vertical. Like any such antenna it requires a good counterpoise (radials, conducting surface). Max. power load 200 W, connector PL female. 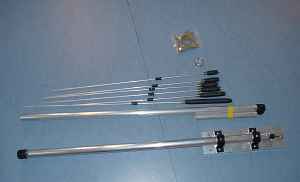 Multiband vertical antenna for 1.8 to 30MHz, with reduced efficiency also useable on 50MHz. Requires a simple coax tuner for operation, the built in tuners usually work well, in some cases a tuner extender (e.g. MFJ-914) is necessary. The antenna can be installed anywhere, either on the rooftop, on the trailer hook or on a camper car during vacations. Due to the slim body the antenna is very unobtrusive. The antenna is fed with a coax cable of any length, PL connector. The radiator is grounded, thus preventing static discharge. Weight only 4kg, transport length only 1.3m, so it fits even baggage on air transports. The vertical distance between the U-brackets is 26cm. Traditional lowcost groundplane antenna. Made of telescopic aluminum tubes which are fixed with stainless steel hose clamps, including solid mast mount. Includes a radial kit of PVC coated copper wire (one radial per band). With more radials the efficiency can be improved further (as with an GP). The vertical distance between the U-brackets is 18cm. Radials for vertical antennas. Consist of two λ/4 wires per band. Uses PVC coated braided copper wire 1.5mm2. Includes solder lugs on one end for easy connection to ground post. These radial kits can be used for elevated antennas (not ground mounted). The radials should be installed so that they do not touch the ground, nor the roof nor any other obstacle. 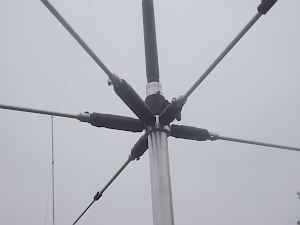 If the vertical antenna should be installed on the ground other radials are required (at least as long as the antenna is high, better longer, as many as possible, not less than 10). Alle prijzen zijn inclusief BTW., maar exclusief verzendkosten. Tussentijdse prijswijzigingen en typefouten voorbehouden. Fabrikanten kunnen specificaties en uitvoeringen wijzigen.